Does a colorless creature count as a mono-colored creature? Two creature-based token makers that strike me as well-suited for commander are Kazuul, Tyrant of the Cliffs and Nacatl War-Pride . Kazuul can either deter your opponents from attacking or give you tokens to block with; any that survive can be sac fodder for Thromak once you're ready to power him out. That the tokens are 3/3 seems relevant as well. War-Pride can give you a very wide attack, and since the tokens aren't exiled until end of turn, they can be devoured second main phase for a giant hellion. While looking at it tonight, I realized that giving extra combat steps with Aggravated Assault should cause each token to make tokens themselves. Further investigation revealed that the tokens would require haste to attack on any additional combat, but that's already worked into the deck anyway. Could be something to try? Sadly, I haven't gotten many games in with my deck, and don't think I've ever gotten to play either card, but they sound awesome to me in theory. I also really like creatures that replace themselves when they die. Mitotic Slime is particularly awesome at this, as each time it dies it splits (after all, I don't care so much about the decreased p/t, but the increased creature count. More bodies to feed the beast!). 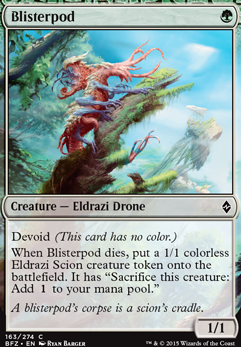 I also run Blisterpod (gives an eldrazi token which can sac for mana), Brindle Shoat (gets bigger body upon death), Thragtusk (mm, taste the value! ), Strangleroot Geist (comes back so long as it hasn't got a counter), and Wurmcoil Engine (not exactly a budget suggestion, but gives two bodies upon death). If you should go with a goblin subtheme, Mogg War Marshal and Goblin Marshal are possibilities, as well as Tuktuk the Explorer . Switched out Blightherder for Eldrazi Obligator . Herder is super fun, but without a playset of Relics in the mainboard, on top of some lower CMC exile spells, it's just too hard to fuel it correctly. Blisterpod out for a 2x of Talisman of Impulse . I liked being able to cast Kozilek's Return without being worried about losing my ramp, but I think the benefit really ended there. For the sake of the removal package I need to be able to make both green and red, and Birds was barely cutting it either. 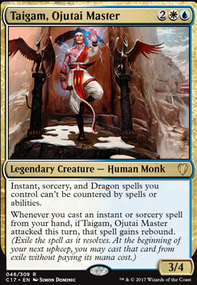 Scion of Ugin is a placeholder for new Ugin. I think it works well with the new Karn, and with the number of colorless and Devoid spells I have in the deck, the cost reduction will be put to good use. Blisterpod and Tukatongue Thallid could be interesting in this deck. So I commented on this deck over 6 months ago and now I saw it on the feed so... Imma do it again. And Imma be more specific this time. Let's start with cuts. Bane of Progress is not great. If all goes well you'll absolutely be hitting your own enchantments and artifacts. Butcher of Malakir is no Savra, Queen of the Golgari. Gray Merchant of Asphodel is not anything exceptional in this brew. Yeah his ETB is really strong but it draws a ton of hate and you don't seem to have many ways of subverting or withstanding that hate. Greenwarden of Murasa is really mana-costly. 6 mana for an eternal witness effect? Pass. It That Betrays is really bad. Better when you can reanimate it, but still unless your opponents are running aristocrats or you're forcing them to sac things (and yeah I know It does that but that's not enough), really bad. Oh yeah, and that thing I said with Gray Merchant about drawing hate? That. Lord of Extinction's lack of trample makes him pretty meh. Mycoloth is great, but the 5-mana slot is competitive. Pathbreaker Ibex honestly doesn't seem that great. Most he's giving your guys is +5 unless you find Lord of Extinction. Terastodon is really cool and all, but it does have one huge drawback... You can EITHER repeat the etb OR have it as a beater. And for 8 mana, repeating the etb is not enough. Wood Elves only tutors up forests. I'd rather run Farhaven Elf in a deck that's half black. Abundance is probably not as good as Phyrexian Arena. Consistent token generators like Awakening Zone and From Beyond are nice, but there are better cards for the mana cost. Greater Good is great when you have larger creatures than this deck does. As it is it's just gonna make you discard a bunch of cards, probably. Torment of Hailfire gives your opponents something you don't want them having: choice. They'll just sac a bunch of useless crap or discard lands. Without steps to limit their options, it's not a great card. So I looked at your maybeboard and holy crap dude, you need to put some of those in. Night Incarnate, Whisper, Blood Liturgist, Savra, Queen of the Golgari, Craterhoof Behemoth, I'm actually adding the first two to my brew now. Thanks for the ideas, sorry for stealing them. Now Imma give you some card suggestions. Blisterpod and Tukatongue Thallid are both 2 creatures for one mana. Diligent Farmhand and Veteran Explorer are good early ramp. You forgot Fleshbag Marauder when you got the rest of the edict gang! Noxious Gearhulk could be a great substitute for Massacre Wurm if you're playing against beefier bois. Thragtusk is pretty underrated in aristocrats. As is Treasure Keeper, but that's less good in your deck since you have a really high mana curve. Vindictive Lich gives you options! Wall of Blossoms is good protection and a draw! Wurmcoil Engine is just the best. 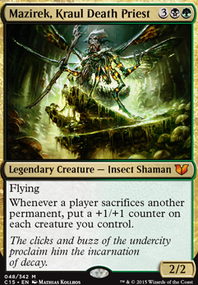 Has a similar problem to Terastodon but it leaves tokens behind, lifelink to eat small creatures, and deathtouch to fell unreasonably large ones. Hell's Caretaker is reanimation and a sac outlet. 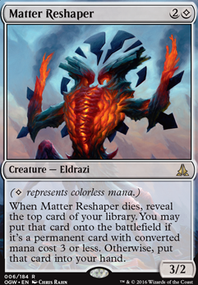 Phyrexian Delver is also good reanimation. Diabolic Intent and Vampiric Tutor are hard tutors. They're any card you want! Perilous Forays is an awesome card for this deck, I love it. Quagmire Druid isn't the greatest ever, but it's enchantment removal. Sadistic Hypnotist can play the long game, run opponents out of resources. Thoughtpicker Witch can screw combo. Vraska, Golgari Queen is an epic sac outlet and the ult is perfect for this deck. Westvale Abbey Flip is pretty good. And a land. Grim Flayer is great card advantage. Fauna Shaman is like Entomb but better maybe? Underrealm Lich is good card advantage. Deathreap Ritual, Lifecrafter's Bestiary, and Skullclamp are all great draw. Blood Artist and Zulaport Cutthroat are both nice sources of damage. SynergyBuild on Its a deck! Well, this isn't a standard deck, so if you change the format to Modern, it should work. Casual, Legacy, and Vintage are also formats this deck is legal in. I can explain format legality further if you want. I need to know a few things before I go over how to improve the deck. Really, the list is an eldrazi-tribal list, with a high-costed top end, and a strange low-end. The first thing I need to know is exactly what the deck's purpose is. Do you want to cast giant eldrazi? Do you want to sacrifice a bunch of little tokens? For example, the Tron lands, Urza's Power Plant, Urza's Tower, and Urza's Mine make enough mana to consistently cast eldrazi, and with Expedition Map to fetch them out, and Eldrazi Temple for additional mana, you can really improve the layout of the deck, and probably the biggest downside is the need to cut a lot of the colored portion of your deck. 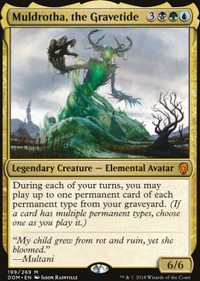 If you like sacrificing little guys, Blisterpod for example, maybe drop the top end of your mana curve, and run Blood Artist/Zulaport Cutthroat along with running cards like Viscera Seer to get a lot of value from sacrificing creatures, digging for more of them, dealing damage to your opponents, and gaining life. with a card like Fecundity you could even draw your deck, and be making mana at the same time to cast it, scrying along the way, draining your opponent to their death. You could also move to a processor-exile build, where you try to exile cards from your opponent's deck, hand, graveyard, and battlefield, just to regain value from them, with cards like Blight Herder or Wasteland Strangler as good processors, and cards like Thought-Knot Seer and Oblivion Ring/Surgical Extraction/Relic of Progenitus, etc. for exile value. Currently the list is split between the green-ramp-into-eldrazi deck and the black-value-oriented-eldrazi deck, neither of which are particularly good in Modern, where they are legal. I would recommend if you decide to stay this route to run Doom Blade or Go for the Throat at least over Grisly Salvage and fix the mana-base up with some dual lands like Hissing Quagmires on a budget. How much money are you willing to spend on this deck? What format is this deck going to be in? 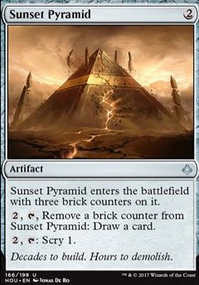 What cards do you own that could fit into the strategy that aren't currently in the deck? Thanks for contacting me! I am happy to help!